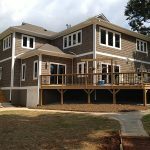 Home Renovation Tips for New Homeowners in Cornelius, NC. Home Renovations in Cornelius – At today’s prices, some new homeowners have to think of the bigger picture when they buy, which usually includes future home renovations. While there are definitely some things in your new home you can live with, there are likely others that you will want to change right away. Start with the kitchen! In the majority of older houses, kitchen remodeling is a must on the to-do list. The kitchen is one of the most-used rooms in the home, and having a space that is both functional and beautiful can make life easier and add to the overall value of the home. Upgrade your cooling, heating and insulation during your home renovations. This can be especially important during basement renovations, when you create more useable living space. When thinking about bathroom renovations, consider stripping each bathroom down to the studs. That way, you can make sure that all piping and electrical wiring are up-to-date and running perfectly before finding out the hard way that they are subpar. If you are thinking about any home renovations for your existing or newly purchased home, call us at Chad Goodin Signature Homes in Cornelius, North Carolina. We have 30 years of expertise in custom homes and house remodeling. Contact us now to see how we can change your starter home into your forever home! For more information on our Home Renovations services, contact us today. At Chad Goodin Signature Homes, we proudly perform home renovations in Cornelius, Mooresville, Davidson, Huntersville and the surrounding Lake Norman area of North Carolina.